After two years of hard work and the efforts of a dedicated team, I am happy to announce that Sensual Mechanical: The Art of Craig Kauffman will be completed, and available for purchase, near the end of October! This 212 page monograph on the life and work of Craig Kauffman was written by Hunter Drohojowska-Philp, the author of the recently published book Rebels in Paradise: The Los Angeles Art Scene and the 1960s as well as of Full Bloom: The Art and Life of Georgia O’Keeffe, and Modernism Rediscovered: The Architectural Photography of Julius Shulman. Drohojowska-Philp has written catalog essays on the work of Kauffman and other contemporary artists such as Robert Graham, Alexis Smith, and John Baldessari. She contributes to Art News and the Los Angeles Times, and is a weekly art critic for KCRW radio in Santa Monica, California. In Sensual Mechanical: The Art of Craig Kauffman, Drohojowska-Philp traces the development of Kauffman’s luminous paintings, which evolved out of architectural rigor and unabashed sensuality. Both traits characterize the extraordinary art and, to some extent, the life of Kauffman. 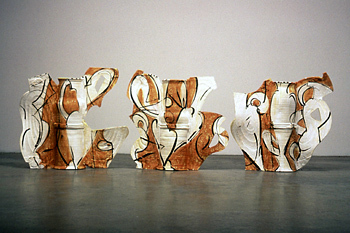 While challenging the accepted norms of art made after the Second World War, Kauffman retained an allegiance to the traditions of Modernism. A sophisticated and self-consciously cultured man, he harnessed his various, and often contradictory, impulses to achieve an unparalleled body of work. 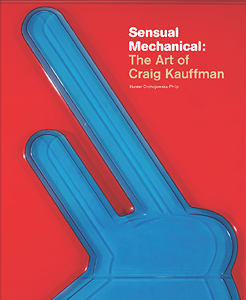 Although Kauffman is one of the most significant figures to emerge from the lively art scene that arose in the 1960s in Los Angeles, Sensual Mechanical: The Art of Craig Kauffman will be the first comprehensive publication of his work. When artists get together, they often talk about their peers. 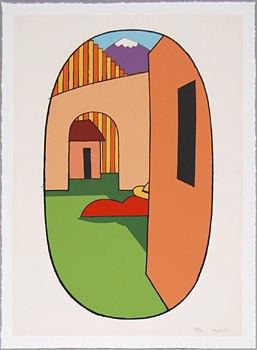 Ken Price was someone that other artists talked about. His influence was profound. 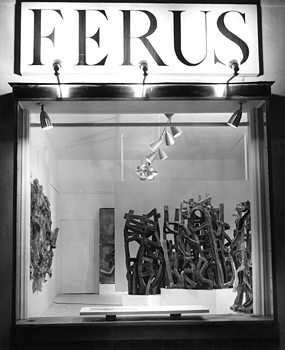 His work was in artist’s collections. Every artist I know spoke with respect for his inventive, colorful, humorous, and brilliant work. That respect was evident at the lender’s luncheon two weeks ago at the Los Angeles County Museum of Art, where Ken Price was honored with a retrospective exhibition and a touching memorial later that day. There was an opportunity for a photo, and it’s an amazing record of the esteem that other artists had for Ken Price. 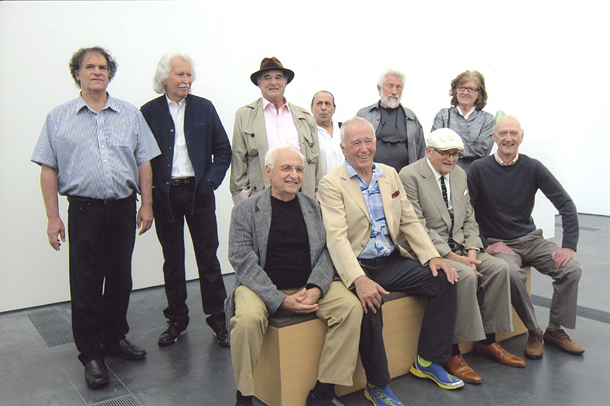 Shown in the photo are (back row, left to right): Tony Berlant, Doug Wheeler, Larry Bell, Ron Cooper, Ed Moses, Vija Celmins, (front row, left to right): Frank Gehry, Billy Al Bengston, David Hockney, and Allen Jones. This past weekend we participated in the second annual LA-Art Platform art fair, held at the Santa Monica Airport’s Barker Hangar. To fill our cozy booth, we brought along works by Larry Bell, Craig Kauffman, and Cindy Kolodziejski. Cindy’s installation, a re-worked version of her Portraits of Sorts and Curiosities, attracted a lot of attention from the press and fair attendees. 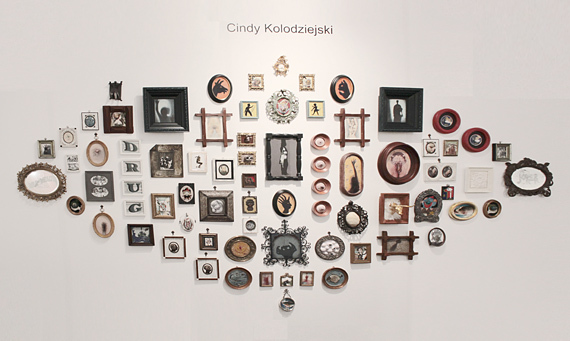 For the fair, Cindy produced 19 new pieces, which she integrated with works from 2011 to create the new installation. She and her husband then personally hung, salon-style, the 74 individual works, creating a stunning ensemble piece. 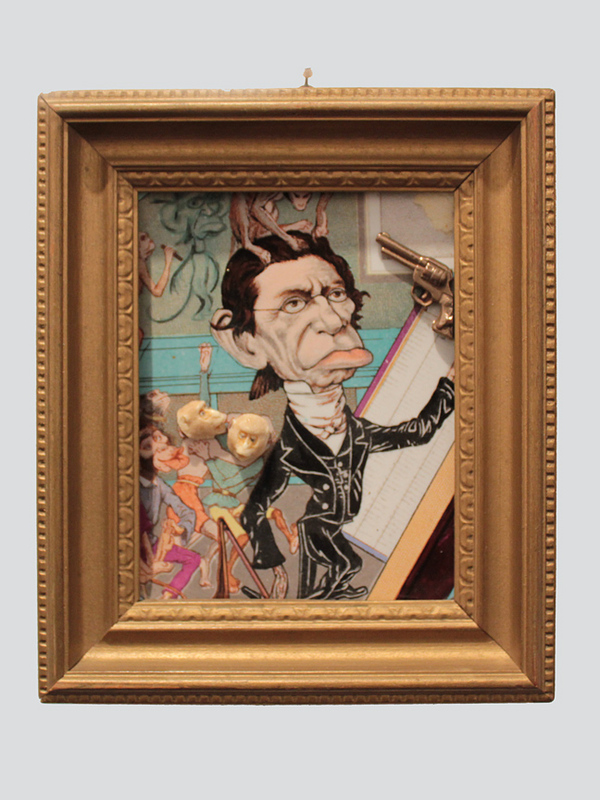 Mounted in a variety of antique frames, some ornately carved or gilded, these small-scale “portraits” fuse two-dimensional imagery with three-dimensional objects that Cindy found, modified, or created. The works address themes as diverse as her materials, and demonstrate her distinctive mix of anatomical, botanical, figurative, and text-based imagery. Framing the curiously eclectic pieces in the style of treasured mementos created an unusual – but still playful – tension that visitors really responded to. Cindy was generous enough to attend the fair all three days it was open, answering the many questions of the public. Because her integration of found and fabricated objects is so seamless, it can be difficult to distinguish between the two in her finished works. It was a pleasure to hear Cindy explain her process to excited fair-goers, who enjoyed their chance to hear from the artist directly.